Samsung Galaxy Tab S4 hands-on hands on review | What Hi-Fi? Like letting a kid open one present on Christmas Eve, Samsung has teased us ahead of its big Note 9 smartphone launch next week, with the announcement of its latest Galaxy tablet. The new Galaxy Tab S4 is the replacement for the Galaxy Tab S3, and takes the renowned line forward with some modest improvements to battery life and storage, and the inclusion of AKG-tuned speakers. First, some number-crunching. While similar in size to its predecessor, the Galaxy Tab S4 narrows the bezels that frames its 10.5in Super AMOLED 2560 x 1600 screen, up from the Tab S3 in both display size and resolution, and screen-to-body ratio. It runs the latest Android platform (8.1 Oreo), and is driven by Qualcomm’s Snapdragon 835 Octa Core processor, which Samsung says is 20 per cent faster than the Tab S3’s chip. Despite some out-of-the-box bloatware, that combination provides the kind of refined experience that we couldn’t find fault with in our short time with it. While the 4GB of RAM goes unchanged, there’s now 64GB (as opposed to 32GB) of storage onboard, which can be expanded by up to 400GB via a MicroSD card - good news for media hoarders and happy snappers. The front selfie camera benefits from a slight bump, gaining a few extra megapixels (from 5MP to 8MP), although Samsung has opted to keep the rear auto-focus camera at 13MP. One of the Tab S4’s biggest spec leaps over the Tab S3 is its 7300mAh battery. That's up considerably from the S3's 6000mAh battery, and promises up to 16 hours of video playback (up from 12 hours) from a single charge. So, we’re pleased that the Tab S4 comes with a more ‘refined’ version. It looks slightly less pen-like, but is more streamlined and ergonomic. The 0.7mm nib allows us to doodle with pinpoint precision as we navigate the interface’s smallest icons. The headline news, however, is that it’s the first tablet compatible with Samsung DeX, which until now has only worked with the Galaxy S8/S8+, Note 8 and S9/S9+ smartphones. 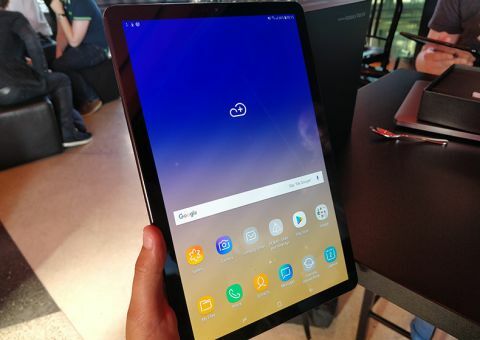 The built-in DeX technology allows the Galaxy Tab S4 to connect (and power) an external monitor, Samsung’s Book Cover keyboard (£119) and a mouse for a more mature desktop experience, giving users the option to switch the tablet from the Android interface to a desktop one. We found it simple to get to grips with; you can launch DeX mode from the Quick Panel (although it seemed to automatically kick into it as soon as it detected a connected device) and we turned it off via the pull-down Android bar. Perhaps the most useful function DeX introduces is ‘dual mode’. When connected together via the Tab S4's USB type-C socket, a Tab S4 and monitor can also be used independently of one another so you can, for example, watch a video on the connected monitor while writing notes on the tablet. In this configuration, the tablet can be used as a trackpad or sketchpad. If you’ve bought into the Samsung Galaxy family, you could benefit from Flow, which allows you to see incoming emails, messages or social media notifications from your phone on your tablet. It also facilitates file sharing between Galaxy devices, but a lack of such devices to hand meant we couldn’t try this feature out. While a 10.5in screen doesn’t make for the most handbag-friendly tablet, it does make the most of its Super AMOLED panel technology and 16:10 aspect ratio. Full HD videos look impressively clean and crisp - perhaps even to benchmark standards. Having considered the Tab S3’s colour performance a bit on the bold side, we do have reservations that the Tab S4 is guilty of a similar offence as blue skies and seas and colourful coral fill the screen. With a slightly higher 2560 x 1600 resolution, it should be sharper than its predecessor’s 2048 x 1536 display – we look forward to sitting them side by side in our full review. For now, we’re satisfied that the Tab S4’s video performance doesn't let the tablet down. The same can be said for the audio. Perhaps unsurprisingly considering the Harman link, the Tab S4’s four speakers (one on each corner) have been tuned by AKG, and as with the Tab S3, there’s support for Dolby Atmos. We watched one of LG and Dolby’s Atmos-supported videos, The Future of Cinema Sound Is Here, and there’s a good sense of not only clarity and space but also dimension. Though the 360-degree effects are nowhere near as enveloping as they are through an Atmos system, the speakers certainly push the sounds of rustling leaves and bird noises well past the screen. There’s a breadth to the presentation that would certainly make watching an Atmos film an above-par tablet experience. The Samsung Galaxy Tab S4 isn’t a million miles from its predecessor, but why should it be? Despite its average sound and overblown colours, the Galaxy Tab S3 was one of the best Android tablets on the market, nicely bridging the gap between the budget Amazon offerings and Apple iPads. But with decent bumps to storage, battery, processor and audio, not to mention the DeX capabilities, there’s enough of an improvement here to believe that the Tab S4 could be a worthy successor. First impressions are positive, but does it do enough to trouble the Apple iPad? We hope to have a review sample soon, so watch this space. The Galaxy Tab S4 will be available from 10th August (the day after the Note 9 announcement), priced £599 (WiFi model) or £649 (LTE model).